Phone-chatting with a YA librarian yesterday, I explained the uneven rhythm of work that rules my life and sometimes consumes me--and I apologized for not being able to talk. She made an odd whooping noise. It startled me into taking the phone off my ear and staring at it for an instant. Then I listened again, catching her midsentence. "...wonderful! I'll tell the kids more books are hatching." Yes. Exactly. I am setting eggs. Garden, mostly planted, weeds, mas o menos under control. The second Faeries Promise book is mostly written--another week or so. 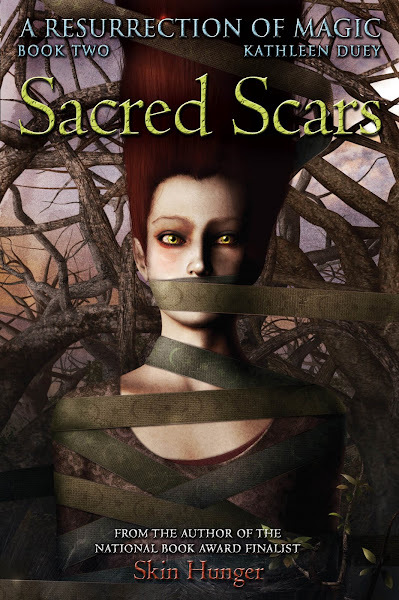 Sacred Scars needs a few more hours in response to the final copy edit and it's off to production. Russet (see post below) is ongoing and absorbing. I usually write fast and furious, but this is totally without a net and I can't explain how great that feels. How real. Free Rat is stalled, but it won't stay that way. The science is burgeoning. My premise becomes more and more probable. STAYS is growing into a great book. Should have the first 60 or so pages together by month's end. The Unicorn short story (currently titled The Third Virgin) is lined up for revision...is all marked up with notes from my amazing editors' astute comments. What else. Oh, a new thing, at the talking stages with my oldest and dearest friend. We spent a couple hours Monday walking in long circles in my little town, talking into my dinky digicorder, laughing like loons, doing the writers'-speed-flash-concept-brain-party thing. We have a *great* idea.